Scottish heritage potatoes are no longer an underground movement, explains Cate Devine. Part of the attraction of traditional tatties is their unusual appearance. For they’re not your conventional plate of mass-market mash; we’re talking vivid colours, knobbly textures and individual histories with each forkful. As Lucy Carroll, co-founder of Carroll’s Heritage Potatoes of Northumberland and Ayrshire, says: ‘From the outside the potatoes don’t look very pretty, and some people are put off by that. But the insides are beautiful.’ Cue a niche market – and happy chefs. Try them at Urban Angel, Iggs and Creelers in Edinburgh, Kinloch Lodge on Skye, Macdonald Hotels, Roots & Fruits in Glasgow, and farmers’ markets. Developed in 1899 in the Border village of Yetholm, once the Gypsy capital of the Borders, by the Little Brothers. 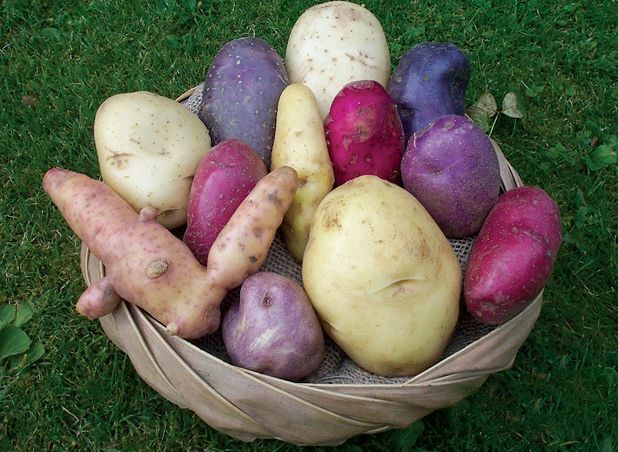 It is unusual because it is the only potato to show red, white and blue variegated skin. It is best boiled or steamed with the skin on. The colour remains, the texture is ﬂoury and the ﬂavour quite delicious. An unusual variety that was ﬁrst bred in Scotland in 1919. When raw, the skin is blue, turning a creamy colour when cooked. The shape is long and more pointed at one end, and it is often known as ram’s horn. The texture of the ﬂesh is ﬂoury, and the ﬂesh is yellow. Good for baking, crisps and mash. As the name suggests, originally grown in the Shetland Isles. The initial sprouts on the seed potatoes are jet black, and the new tubers have a mottled, very dark blue/purple skin. The potatoes are on the small side in comparison with supermarket-bought produce, but they have a delicious taste and distinctive blue antioxidant ring. Dates back to at least 1936, when it was used to add appropriate colour to a meal for the Duke of Burgundy in the Savoy. Highland Burgundy red has a dull russet layer over a bright burgundy skin. The tubers are oval to long oval. They make excellent novelty chips, crisps and mash, though they’re a more specialist market. Nutritionists say that the antioxidants provide many health beneﬁts. The oldest Arran still available. Arran Victory was bred in the Isle of Arran by Donald Mackelvie in 1918 and named to celebrate the end of the Great War. The vivid blue/purple skin contrasts with the bright white ﬂesh. It is ﬂoury and good for mash. They are still regarded as the premium late-season variety. Bred in 1936 by Charles T Spence of Tyneﬁeld Farm, Dunbar, and very rare. Rovers are oval in shape with white skin and snowy white ﬂesh. It may not be a perfect, shiny white modern potato, but the cooking and taste quality are excellent. The ﬂesh is ﬂoury, and they have a pleasant, sweet ﬂavour. Great roasted, baked and mashed. Cate Devine is The Herald’s food writer.